Let’s define the key terms for this article before we launch into a full-fledged discussion of the topic. The startups that I speak of consist of teams of under ten people. The specific startup that I work for, Tint is only a team of four, including myself. By “early stage,” I mean a startup in the process of scaling, meaning the startup has already found a product-market fit and has already accumulated a retainable customer base. 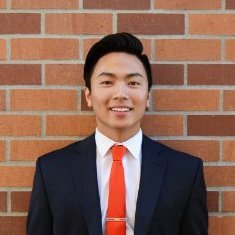 Finally, let’s define “job.” This article is directed primarily towards college underclassmen, as upperclassmen college students have typically already begun the recruiting process and have full time corporate jobs on the mind, or else are aiming to start their own companies, rather than work for other people’s startups. Like I mentioned in the previous paragraph, because of inexperience and an unproven or even absent track record, the traditional internship application method all but condemns college underclassmen. Most startups don’t even offer a traditional internship application process. These teams are looking to maximize profits and growth; spending time, money, or energy on an intern is not likely to be something written into the company’s business plan as something that will aid in achieving their short term goals–staying alive and growing. So the fact of the matter is, you’re going to have to hustle. You’re going to have to convince them. But in order to convince them, first you’re going to need to get in touch. Without contact information (ie: email address or phone number) or a mutual friend, you can whip up the most brilliant email draft pitching your qualifications, and it would be just like building a beautiful state-of-the-art space rocket and leaving it on the launch pad. It’s often said in our interconnected society that it’s not what you know, but who you know that’s important, and that’s undeniable. Networking and meeting the right individuals can open doors to opportunities unobtainable by other equally qualified individuals. So ask around to see who might know someone working in a startup, you never know who can put you in contact with someone who can have a huge impact in your life. If no one that you know knows anyone who can be of any use in helping you get a internship at a startup, it’s time to do some detective work and send some cold emails. Check out our blog post here to read all about how to cold email effectively. To summarize, a tool called Rapportive can help you identify correct email addresses. The rest is up to you to persuade them. Here’s the most important step. Convincing them. Whether you acquired their email address from your network or by trying countless email permutations with Rapportive, how well you communicate over email to sell yourself is going to determine whether your summer is going to be one of action and learning, or one of popsicles, endless movie marathons, and lots of time spent in your parents’ house (which actually doesn’t sound like a bad alternative). Craft a well articulated introductory email explaining who you are, what you’re studying, how you found the startup, your interest in an internship position, and end with an invitation to discuss the opportunity further, putting the ball in their court. They might not respond in the next week. They probably won’t. Don’t expect them to. Definitely don’t get disheartened if they don’t. Here’s where you prove your mettle. You’re not going to give up because of a non-response because that’s what someone else who doesn’t want it as badly as you do would do. You’re going to send a follow up email, sometimes even two, until the startup founder responds, if only in hopes that he can end the email thread as soon as possible. Persistence is key. Once you’ve got your foot in the door this way, you have a small window to intrigue the startup founder before he decides that you’re wasting his time and he never wants to see your name ever again. But how to approach this? Sell yourself. Obviously. But what’s the best way? Remember now that humans are inherently selfish beings, always looking out for what can most benefit them. That’s the currency in which you’re going to have to sell yourself–your value to anonymous startup founder. Be specific. Identify a problem that they have that suits your skill set, and offer to step in to solve that problem. There won’t be formal positions in a startup to apply for, so you’ll have to create your own role. Make it clear that what you’re looking for is an opportunity and environment to grow and gain professional experience, while helping drive the company’s growth by contributing X, Y and Z. It’s hard to say no to a win-win relationship. Another crucial strategy: selling your effort and enthusiasm. Don’t kid yourself, there are plenty of people smarter and more skilled than you. How you’re going to differentiate yourself is through the promise that you will absolutely work circles around any alternative options that Mr. Startup founder might be considering. Even persistence and work ethic aren’t enough though. Words are nothing but air passing through vocal chords without actions to give them credibility. Study the company, put together a thorough report of your experience in using their product, as well as what problems you found and what solutions you would suggest. This will go a long way towards impressing the startup founder and proving to him that you really want it as badly as you say you do. Finally, never, never give up. Determination is an admirable trait, and demonstrating it through your dogged pursuit of an internship also hints at a relentless work ethic. However, realistically, you’re not going to get what you want 100% of the time, so in the event that you’re not able to convince the startup you’re looking to work for, graciously accept failure, learn, and adapt. After all, failure is nothing more than an opportunity to learn and grow. So fail fast and fail often. How do I know this works? It’s the reason that I’m in the position that I’m in now, writing this blog article that will (hopefully) help you achieve the same goal. Check out these pictures from my experience. 60 Email thread. See? Perseverance. Look at those followups. Triple emailing with no response. Will get you in trouble in the texting world but in this scenario? Completely OK. Going all out selling myself on effort and enthusiasm. What did you think of these strategies? Have you gone about this process differently yourself? What tips would you give me to better my approach? Let me know your thoughts in the comments below! Great post. It is evident in how you approach problems that you are mature and thoughtful. Most people would have given up at email #1. I would even say your approach can be applied to fundraising, biz dev and sales. One tool you didn’t mention is LinkedIn. I would encourage students, even in high school, to develop a network with your friends’ parents since you never know where opportunities and contacts lie. Finally, KIIS, keep it simple ‘silly’ in correspondence since startups are time constrained. I know many entrepreneurs/investors that don’t read past the first two lines. Peace! absolutely love the Tint, i have just added it to my flower delivery store flowerstation.co.uk awesome. Loved this piece. 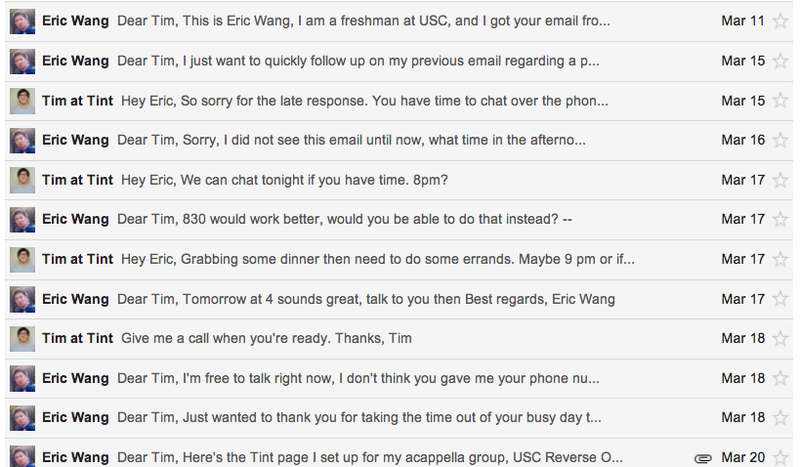 Eric, I’m much like you in my ambitions and “pedal to the metal” attitude. I have a history working for some good startups which have been acquired, and have started a few projects of my own. But I’m ready now to enter the startup world again. In fact, the past 2 weeks I’ve been emailing startups with notes about why I love what they’re doing, and feedback/growth suggestions I have about moving their product forward. Landed one interview, and think I came off too strong. I’m insanely driven and intense, and think that it takes a certain type of person to appreciate that. Who knows, maybe that passion came across as desperate. It’s not that I *needed* the job, but I just really *wanted* it. Anyway, reading your emails in this article has been extremely helpful. 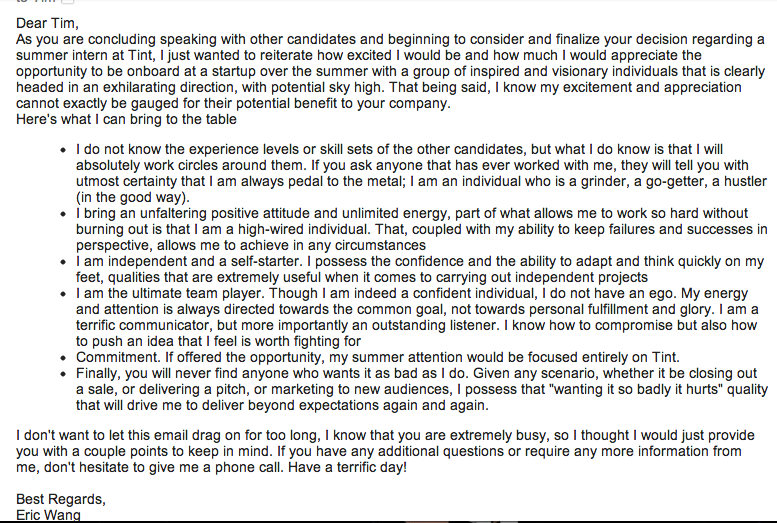 It definitely gives me hope that the right startup will appreciate me. Cheers!